As beauty editors, we get bombarded with a ton of new products every day (we know—tough life). Reviewed is a series where we report on some of the best ones we’ve tried. Whether it’s a drugstore lipstick that lasted all day or a hand cream that saved us this winter, you’ll find all of our favorites in this column. Enjoy! Recently, I saw a dermatologist who instructed me to work more vitamin C into my skincare routine. Just a few days later, I walked into a sunny event space to check out the new Ole Henriksen product release firsthand. And guess what? As fate would have it, the skincare brand was launching a new addition to its Power Peel collection, a 25% vitamin C–intensive treatment system, Ole Henriksen’s Power Bright Skin Treatment ($55). How perfect, I thought as I slipped on a fluffy white robe and matching slippers. Inspired by Ole Henriksen’s Power Peel, the most-requested treatment at his spa, the three-step treatment boasts instant and dramatic results. The first step is a Truth Sugar Glow Polishing Mask made with sugar, honey, pomegranate seeds, and citrus extracts to exfoliate, purify, and smooth your skin. Immediately I felt the effects—the polish left my skin feeling cleansed and super soft but not tight. Next is the Radiant Truth 25% Vitamin C Intensive treatment. And yes, 25% is a lot. 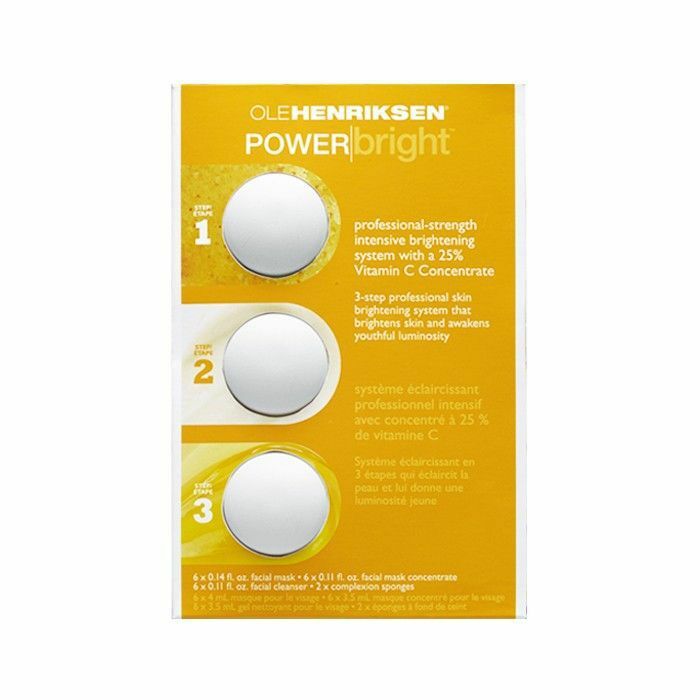 But I spoke with Henriksen himself, and he assured me it’s absolutely doable for sensitive skin types. The formula also includes moringa seed and turmeric root for its depuffing and brightening properties. Let it sit on your skin for a minute or two to get the full effect. At most, you’ll feel a small tingle as you apply it, but once you add the following step, it feels completely comfortable. The last (and perhaps most feel-good step) is the Pure Truth Melting Cleanser, which is super nourishing. Layer it on top of the concentrate to help activate it: You’ll feel a nice warming sensation. It’s made with vitamin C, virgin cherry, and rose hip seed oils to truly melt away impurities. Rinse it off with the handy sponges provided and you’re all set! I left feeling rejuvenated and radiant. The best part? It comes in cute little trays with the perfect amount sized out for you—that way you won’t overuse the product and you can feel like a facialist for a few minutes. Each box contains six treatment sleeves with three numbered pods, so it’ll last you almost two months if used weekly. I’ve decided to make it my Sunday afternoon ritual (and I think you should too). Want to read about my other must-haves? You're going love Make Up For Ever’s Pro Sculpting Brow Pencil.